I made this dish midweek so I prepared the carrots in advance. I do not peel carrots, I find peeling them to be needlessly time consuming. The aesthetics are not worth the work to me. Instead of just bringing the carrot juice, rosemary, and butter to a boil and then adding the carrots. I sauteed the rosemary in the butter with salt and pepper for a while to infuse the butter with rosemary. Then I cooked the carrots in the butter until they started to brown a little with the hopes that they would absorb the butter and rosemary, so I could skip fishing out carrots from the broth before serving them in order to finish them in butter? This techinque worked very well. After the carrots started to soften, I added the carrot juice and brought it to a boil; cooking the carrots until tender. I found the flavor of the finished carrots to be too sweet... too carroty. So I sautéed the bacon and added the bits to the carrots. The salty fattiness of the bacon off set the sweetness of the carrots; making them taste much better. I left the grease in the skillet. When I was ready to cook the scallops, which I dried very well, I added a little butter to the pan and heated it up. I have learned that scallops get a nice sear on them if you do not move them in the pan for about 4 minutes. The second side of the scallops I cook for about 2 to 3 minutes depending on how thick they are. I prepared quinoa in a rice cooker with chicken broth and butter. When the scallops were done I scooped some quinoa into each plate, topping it with scallops and ladling the carrot bacon gravy over the fish. The quinoa tasted delicious soaked with the carrot sauce. My kids' only complaint was that carrots alone are too sweet. They would like some cauliflower mixed with them next time... can you believe it; my kids asked for more vegetables! 1) In a medium size sauce pan heat the butter and oil for the carrots. Add the rosemary, salt and pepper. Let infuse for a minute. 2) Saute the carrots in the butter/oil until lightly brown. 3) Add carrot juice and bring to a boil. Simmer for 5 to 10 minutes depending on how soft you like your carrots. 4) While carrots are simmering, in a large non-stick frying pan on medium high heat cook the bacon. I chop it into pieces before I cook it. 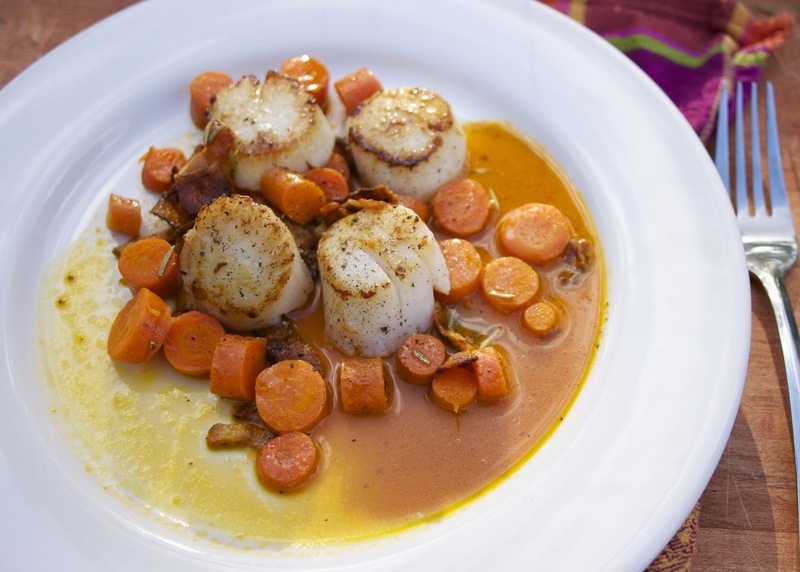 5) Add bacon bits to carrots and let sit until scallops are cooked. 6) On medium high, heat up the bacon fat and add 1/2 tablespoon of butter to it. When the pan is good and hot and the well dried scallops with a sprinkle of salt on them to the pan. Do not move them for 4 minutes. Flip and cook on second side for 2 to 4 minutes depending on thickness. If the scallops start to separate they are very done, get them off of the heat. 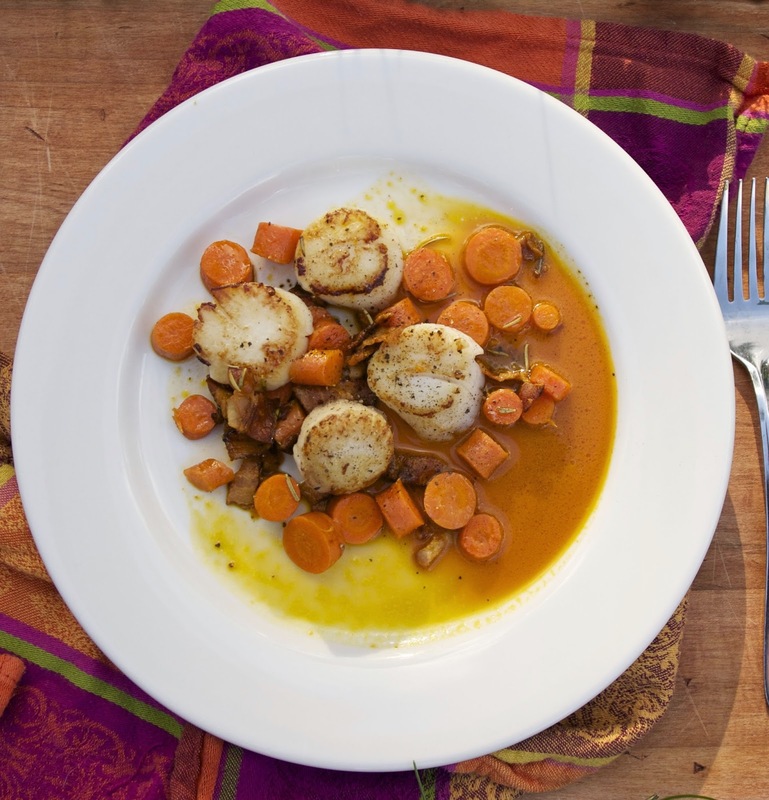 7) Serve scallops over potatoes, rice, or quinoa. Ladel carrots and broth over the scallops. 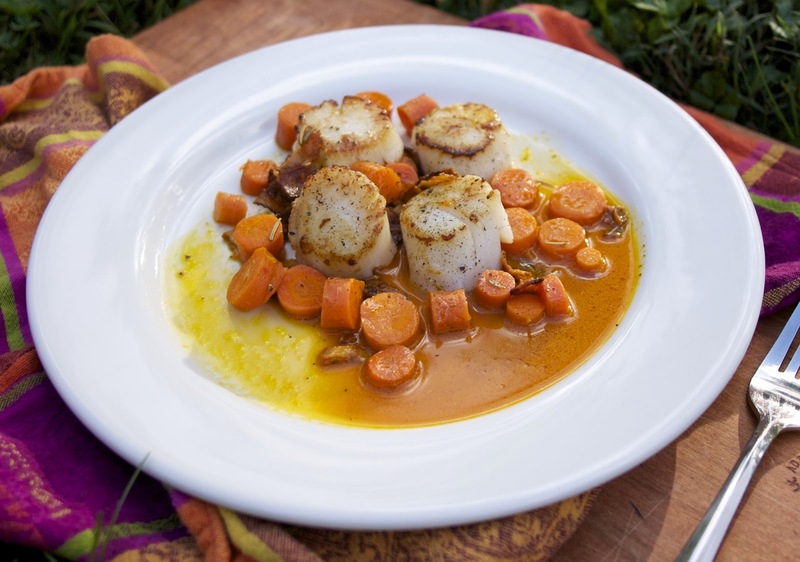 Click here for Dorie's Monkfish and Double Carrots recipe. I wish I had enjoyed this one more - I made it last night and wasn't wowed. Your treatment of the carrots - sautéing the rosemary with the butter instead of simmering everything together - would have been an improvement. I thought the browned bacon and fish/scallops bits in the pan went to waste too. So sorry to hear that it don't work out for you. I really let the carrots and bacon sit for a few hours. It was delicious on it's own. I don't know if you want to try it again, but it did work out well. I didn't give the carrots and bacon a chance to develop. I cooked everything start to finish in less than an hour. I don't feel so bad now. I thought the carrots were a bit sweet as well - the bacon did help. (Although, I cheated and roasted the carrots, which may have contributed to the sweet factor). 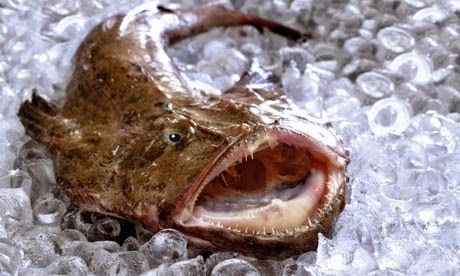 Yep, that monkfish has a face that only a mother could love. I thought that this dish was fab with scallops, probably better than the monkfish anyway. Your quinoa side dish sounds like the perfect accompaniment. Quinoa would have been great with this. I enjoyed the carrots, but I also added more rosemary than was probably required. My dogs loved the carrots - they gave them 4 paws up! Great photos! Our dog used to love carrots then I think a dog at the park told her they are healthy. 4 paws up love that. The scallops look perfectly done. I think they'd be good with the dish. I enjoyed the carrots, but I think the salty, savoury bacon bits helped temper the sweetness for me. My son still prefers raw carrots. Thanks for the information about monkfish and over fishing. It is an ugly fish. I also thought fishing out carrots to finish the sauce an extra step I did not want so I just left it out and served as is. I liked this one but I do prefer roasted carrots. I made mine with a different kind of fish, but the scallops look great too. (They were too pricey this week, but another time.) I think the double carrot treatment made this very sweet, so another vegetable would be a nice foil to all that carrotiness. I was surprised that I liked this combination of flavors. Well that's one ugly fish! I'm always iffy about cooked carrots. Sometimes yes...sometimes no. I don't like them too sweet--your bacon move sounds like a good one. Thank you for stopping in and linking. I'm always afraid to cook scallops at home. You make it sound so easy! Scallops really are easy to cook. Just make sure the skillet is hot and the scallops are dry. Once you put them on the skillet don't move them for 4 minutes. Too funny ! Thankfully I had not seen a picture of the monkfish prior to cooking and serving it. I have a policy of not Google imaging health issues and I am now thinking this may carry over to seafood (and possible cuts of meat...). Egad that is one ugly fish. But the dish was fabulous and the taste testers certainly enjoyed it. I will likely revisit it with the scallops and plan to do the carrot sauce/side again with out the fish. It was THAT good. I never realized how bothered I am by the looks of some sea creatures. You can tell they are the inspiration for monsters. Glad you liked the carrots too... I think this can work with lots of things including chicken. I'm with your kids on this one, I thought it needed something to absorb some of the carrot flavours, I used mashed potatoes and kids were happy! Hi, I'm your neighbor from the Moonlight and Mason Jars party. 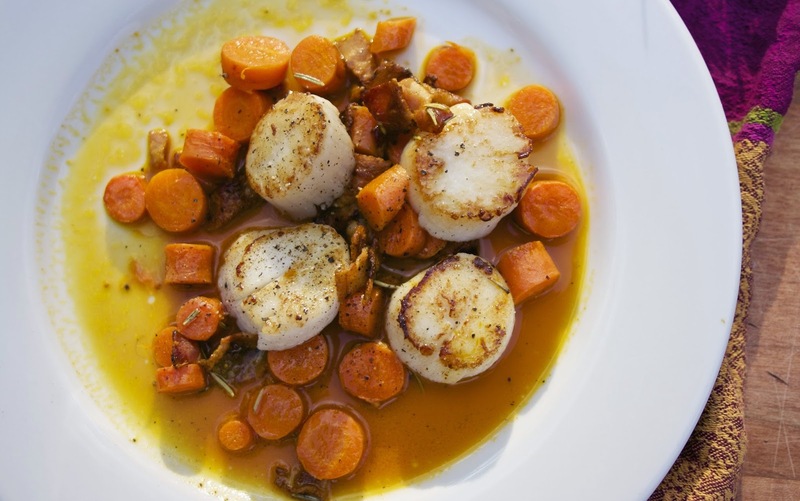 I absolutely LOVE scallops, and never thought of cooking them with carrots. Sounds delicious, and looks great! I like both monkfish and scallops but I love how you adapted this dish, Diane. It looks delicious! I like the idea of adding some cauliflower though, that could be good too. Thank you for sharing with us at the Hearth and Soul hop. My husband would flip for this! Thank you so much for linking up at Tasty Tuesday! Your recipe has been pinned to the Tasty Tuesday Pinterest board! Please join us again this week! Looks like you got just the right combination for this dish, it looks delicious. Hope you are having a great day and thanks so much for sharing your awesome post with Full Plate Thursday!